Rude cakes never say please, or thank you, or listen to their parents – but this rude cake is about to learn his lesson when he doesn’t get his way! 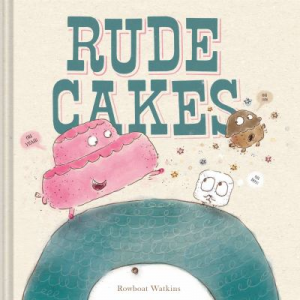 This week’s picture book, Rude Cakes by Rowboat Watkins, shares the story of one such dessert who inconsiderate actions leave donut holes and marshmallows feeling blue. One night, when he is goofing off rather than listening to his parents about bedtime, the rude cake is taken on the ride of his life as a cyclops interferes with his good time! Rowboat Wilson’s story and illustrations share a story that is sure to get readers of all ages laughing while reflecting on the importance of good manners.